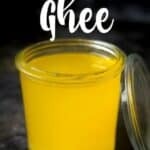 If anyone has been wondering how to make Ghee you are in luck! 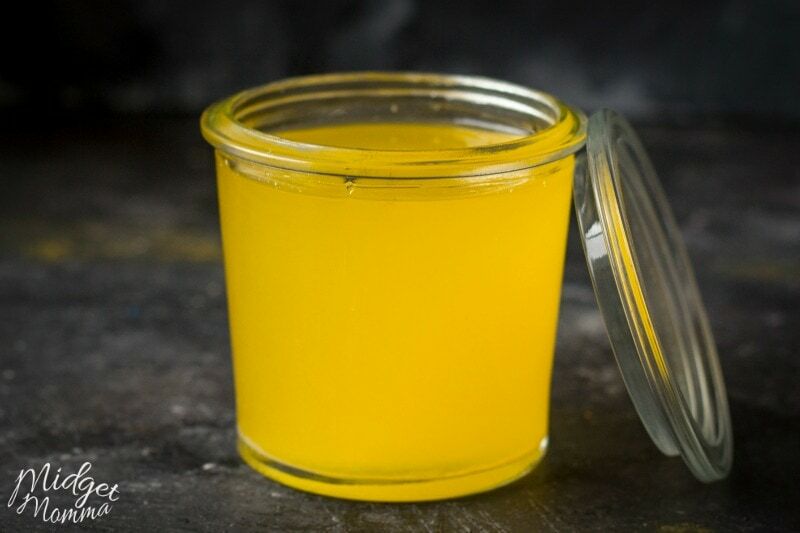 You can save yourself a LOT of money by making Ghee yourself! 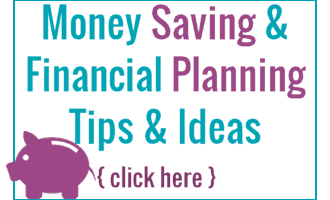 When you are planning your grocery trips, make sure you check out the Keto Aldi Shopping list and this Keto Items to Buy at Walmart list. Now I have to tell you a funny story because I am sure it will make you laugh. I have a friend, who I love but she is always cracking me up. She went to a mommy and me playdate because she is trying to make new mom friends. Somehow they all got into a conversation about diets and what people eat ect and in the conversation one lady said she never cooks with butter. When my friend heard that she told me she thought to herself “How can I be friends with someone who doesn’t cook with BUTTER!?!?”. So yes, there people out there who do not cook with butter…I know it is a funny thought! I know I cooked with butter even before I went Keto so even that thought shocks me still. In her conversation with me after telling me about how she was also driving 45 minutes multiple times per week to Trader Joes because she needed ghee. She was telling me about how ghee is the healthier version of butter because she cooks everything with it (or butter). What is kinda crazy is that you don’t need to drive extra trips to the store to get ghee because you can make it at home SOOOO easily! 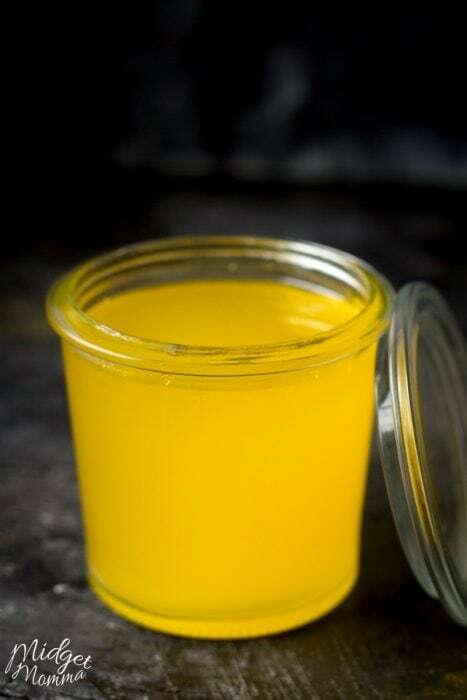 Ghee is very similar to clarified butter. 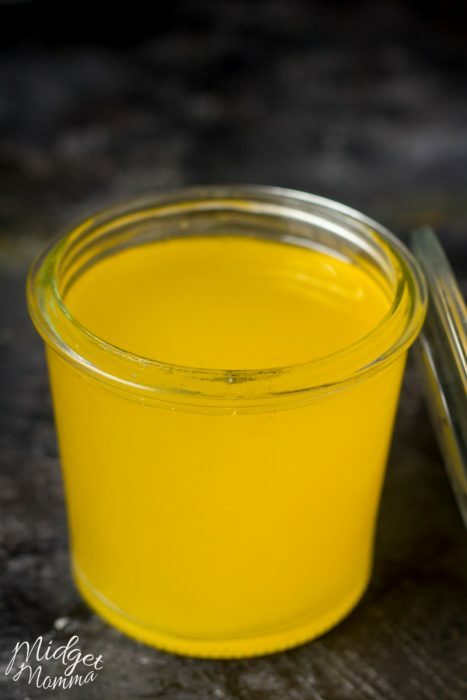 Clarified butter is just butter that has the milk solids removed from it. When I was in cooking school we used to have to make clarified butter all the time. Just melt the butter then transfer it over to a Tupperware container. Then let it solidified overnight in the refrigerator. Once it hardened the milk solids would be resting right on top so you would just need to scrap the milk solids off the top. If you still have some milk solids left when you melt down your butter you just need to slowly pour the butter into another container and stop once you have reached the milk solids part. Your ghee will solidify once it has cooled and then you just cook with it like you do butter. Store your ghee in a container of your choosing, i like using mason jars with the screw on top to store mine in the fridge. This ghee recipe can be made as large as you like to for your needs you just need to add more butter to be melted. See guys, it is soooo easy! So skip going to the store to buy ghee, where it is costing you more and just make it at home! I looked on Amazon and some of the ghee is $34 a container! OUCH! 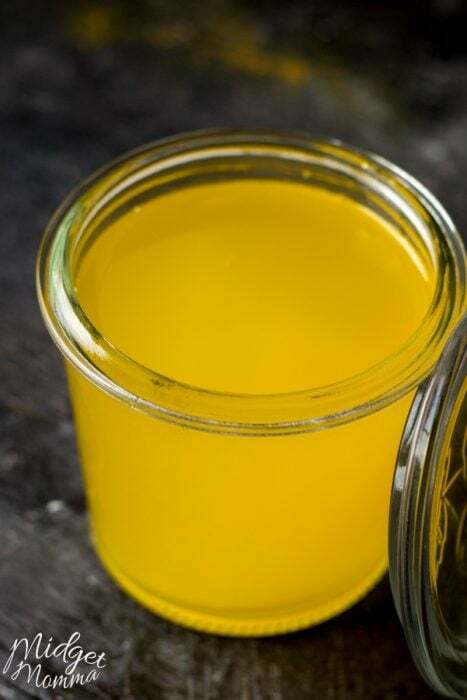 Making ghee at home is so much cheaper, and it is also fresher too! Melt your butter over medium-high heat. Once it has come to a simmer turn your timer on for 4 minutes, keeping an eye on the butter to make sure it doesn't start to brown. Once the timer has gone off remove the butter from the heat. Pour the butter into a glass or plastic container with a tight-fitting lid. Place the container in the fridge overnight. Remove the container from the fridge. Using a spoon scrape the top white milk solids off the top of the butter and discard the milk solids. Store in an airtight container in the fridge. Your ghee will solidify again once it has cooled and then you just cook with it like you do butter. What is the difference btwn European Butter & margarine? Hi, thank you so much for this recipe! I’m not sure if I did mine right because most of the white solids are on the bottom, with just small spots of it on top. Should I redo it? Or is the yellow that I do have still ghee? The white part is the fat so you can place the butter in the fridge overnight and then remove it from the container and scrape off the white parts. The yellow is the ghee.